Product #21224 | SKU 883954 | 0.0 (no ratings yet) Thanks for your rating! For high image quality, you know you'Voe got to have high quality glass, and Sigma has incorporated their Special Low Dispersion (SLD) glass element into the 18-250mm. In addition to the SLD element, three aspherical lenses, including a double-sided aspherical lens, have been used in the lens' construction--offering excellent correction of colour aberration, for better clarity and quality of images throughout the zoom range. 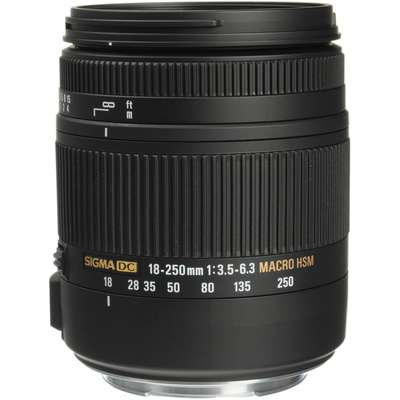 For a lens that offers a wide-angle to telephoto focal length, the ability to zoom-in with macro photography, and provides Optical Stabilisation built-in, Sigma's 18-250mm F3.5-6.3 DC Macro OS HSM made for Canon cameras is more than a match. Whether you're on a macro product shoot, a walk in the park, or have a wedding to go to, this lens will help you shoot high quality images in any situation.